This is a Tasting Table recipe that I’ve adapted after I realized that I had all the ingredients in my pantry. I’ve made small changes like using frozen blueberries that I thawed out and gently patted down with a paper towel, and then I cut down the sugar and skipped the sugar topping altogether. All my changes are reflected below. 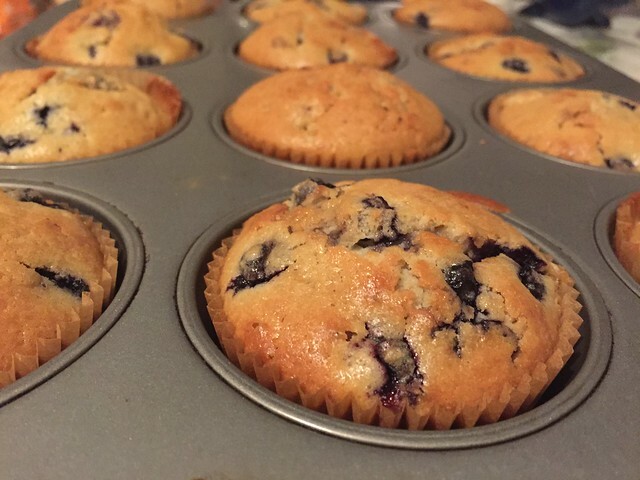 This batch made 12 incredibly tasty muffins that I ate for breakfast, afternoon snack, and a late dessert! 1. Preheat the oven to 375º and line a standard muffin tin with paper liners. In a medium bowl, whisk together the flour, baking powder, salt and cardamom, then set aside. 2. In a stand mixer fitted with the paddle attachment, beat the butter with the sugar and vanilla, about 3 minutes. Add the eggs, one at a time, beating well until incorporated before adding the next. With the motor running, slowly add the flour mixture in 2 additions, alternating with the milk, until a smooth batter comes together with the help of a spatula. 3. Remove the bowl from the stand mixer and fold in the blueberries. Divide the batter between the muffin liners. Bake until golden brown for about 30 minutes. There are a lot of cheap muffin liners out there, but I quite like these large ones for breakfast items because I like more cake in my muffins.